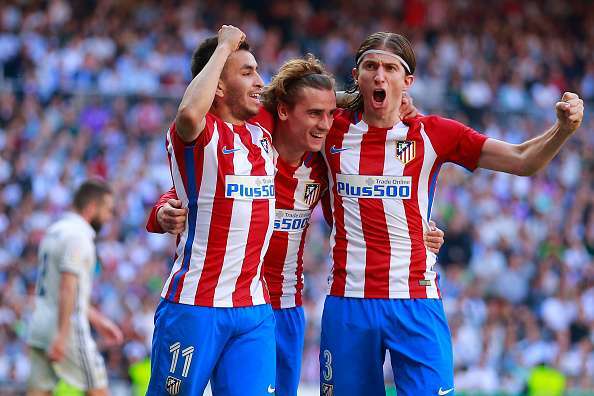 A few years ago, the Derbi Madrilenos between Real Madrid and Atletico Madrid was only going to have one winner, with the former dominating most derbies. But that is not the case anymore. In fact, if anything, the Rojiblancos have had the upper hand over their richer city rivals over the past few years. After last night’s draw, Real Madrid have only managed to win once in the five Madrid derbies played at the Santiago Bernabeu. After scoring the first goal through a Pepe header, the Galacticos lost the lead to Antoine Griezmann’s well-taken finish late in the game. Diego Simeone was absolutely ecstatic with the result and his celebration after the game oozed just that. The Costa Rican had a good game between the sticks as he made three good saves – one from Fernando Torres and twice from Antoine Griezmann – before letting the ball past him from the Frenchman’s shot in the dying minutes of the game. The Spaniard had a decent game in general as he did well to keep out his compatriot, Koke, for the majority of the game. However, he was culpable of not covering Nacho and not stopping Angel Correa’s through-ball that led to Griezmann’s goal. The Spain and Real Madrid captain had a quiet game, but almost gave away a free goal to the Rojiblancos as his “through-ball” to Antoine Griezmann went unpunished, thanks to a last minute intervention from Keylor Navas. The Portugal international scored Real Madrid’s only goal of the game with a fine header from a Toni Kroos set-piece. He was also solid at the back and the Atleti forwards couldn’t really find a way past him while he was on the pitch. This was one of those rare games where Marcelo couldn’t produce a solid attacking performance, partly due to the fact that he was burdened with more defensive duties against a strong Atleti team. He was also not helped from the attackers in front of him, including Cristiano Ronaldo, who never really tracked back, isolating the Brazilian against Atletico’s attackers. The tough-tackling Brazilian covered a lot of ground and kept hassling the Atletico Madrid all throughout the game. He was Real Madrid’s most successful tackler and interceptor with 6 successful tackles and 3 interceptions, while also covering a lot of ground in the process. The German is Real Madrid’s lynchpin in both midfield and at taking set-pieces. His set-piece resulted in Pepe’s goal and it was after he was subbed when Real Madrid lost their balance and gave away the equaliser. It seems as though the Croatian is suffering from a lapse in form. Although he put in a performance better than he did in the previous games, he is nowhere near the level that he is truly capable of, something that Real Madrid requires so desperately at this phase of the season. The Portugal captain had his moments in an otherwise dull game. It seems as though age has finally taken its toll on the former Manchester United forward. Although he was involved in some good attacking moves, he couldn’t inspire the team like he usually does and also left Marcelo all by himself to do the defensive work against a team like Atletico Madrid. I have absolutely no idea as to what he did in the game. The Welshman has been in terrible form since returning from injury, which begs the question as to why he has started in every single game and isn’t just eased in. The fact that he started the game after Alvaro Morata’s hat trick in the previous games shows the faith that Zinedine Zidane has in his compatriot. Unfortunately, Benzema couldn’t make it 5 goals in as many games as he was largely invisible all throughout. One of the rare moments when he was at fault for leaving his marker, Griezmann, which led to the Frenchman scoring. Nothing fancy about his performance after coming on from the bench. Looked out of touch and made a mess with hard first-touches. He was the reason why Atletico Madrid didn’t lose the game. After a series of fantastic saves, a Pepe header was what it took to get the better of him. A solid game from the Spaniard, nothing spectacular and no-nonsense defending. He had a largely successful evening when it came to keeping the Galacticos record goalscorer quiet and also provided the extra man in attack sparingly. Savage. Absolutely mental. When Cristiano Ronaldo went around Jan Oblak, it seemed as though the ball would ripple the back of the net, but Savic’s incredible last moment goal-line clearance stopped Ronaldo from scoring. Godin was at fault for not marking Ronaldo, but was bailed out by Savic’s fantastic clearance. Other than that, the Uruguayan had a decent game. The left-back slowly grew into the game and showed real steel in the last few minutes as kept harrying Cristiano Ronaldo and Lucas Vazquez whenever they attacked his zone. He didn’t offer much in attack, though. Carrasco man is one of the most underrated players in the world as he put in another good shift on the right-hand side of Atletico’s play. He constantly caused Marcelo trouble and also helped out Juanfran in defence. Gabi was often slow in the turn and allowed Real players to breach through. The Spaniard didn’t really provide the creative spark that he usually does, but did a lot of defensive work while covering a lot of ground and helping his team-mates out against the Real Madrid attack. Nothing much to write about his performance as he had a really average game. The former Liverpool man had some really good moments and could have actually scored for his team, but couldn’t beat Navas. He grabbed the headlines with the equaliser which was a well-taken goal, but he also missed some chances prior to that. Another good outing for the Frenchman. Correa’s through-ball to Griezmann was a work of art and his impact after coming on helped Atleti grab an important point. Didn’t play long enough or do anything to warrant a rating.